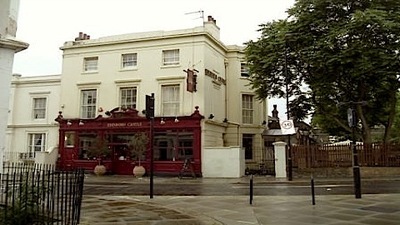 The Edinboro Castle (no I haven't spelt it wrong) is a pub situated in Camden Town. It is hidden away in corner of Camden, with Regent's Park to the left, and the centre of Camden to the right. It is draped in trees and fairy lights, and is a mixture of old and new decor, with an impressive beer garden to the front, designed to endure all weathers. They serves food until half an hour before closing every day. The menu includes everything from simple bar snacks through to full dishes that would not be out of place in a posh restaurant. They have also just introduced their Prix Fix menu, during the week, with two courses for £10.00 or three for £13.00, which is perfect for good food on a budget. The bar is extensively stocked with a variety of international bottled beers, real ales, an impressive wine list and a variety of Fruit beers. The strawberry fruli (beer, I'm not sure that is the literal translation) is a favourite of mine, perfect to cool you down on a sunny afternoon. I defy you not to try it, even if you are not a beer drinker, you will not regret it! In order to experience the best of the Edinboro Castle, I recommend visiting the beer garden on a sunny day, or even a cold day as they have plenty of outdoor heating and coverage. On the hotter days, they have a full BBQ running, with an additional bar open outside, serving a variety of ciders and other summery drinks. This is ideal as the main bar gets very busy, particularly early evening during the summer. Luckily the beer garden is one of the biggest in London, so there is plenty of space. I do recommend ringing ahead and booking a table, if you are with large group, just to make sure you all get seated. They also have Pimms on tap, can you think of anything more summery? 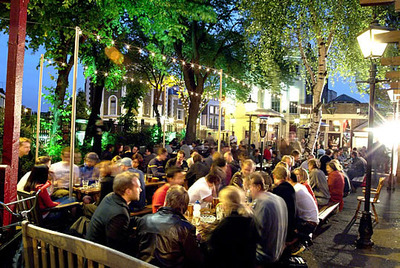 As the sun goes down, the fairy lights come on, and it is a lovely atmosphere for cooling down on a long hot day, or the beginning of a wild night in Camden. Dress code is casual and relaxed, and they are also happy to provide water for tired dogs, who have spent the day running around the park. Check out the website for more information and upcoming events, and to book for larger parties or events.